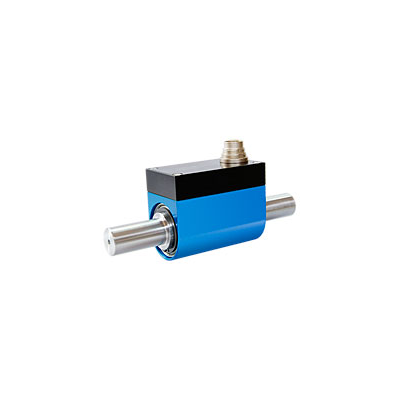 Torque transducers with non contact transmission are supplied as active sensors with integrated measuring amplifiers; as output signals, analog ±5V by default, ±10V optionally, or digital RS485 or USB are available. By the non contact transmission, the measurement data are transmitted main­te­nance-free and without signal distortion between rotor and stator. Integrated speed/angle mea­sure­ment is available as an option for almost all non contact sensors. Mechanically, our non contact transducers can be divided in 2 sections: sensors with bearings and bearingless sensors. The ad­van­tage of bearingless transducers is that bearing friction cannot falsify the measurement result and they are usually designed for higher speeds. For digital sensors, we distinguish 2 product groups: sensors with RS485 interfaces or transducers with USB interfaces. RS485 torque transducers are characterized by a particularly high noise immunity, even with very long connection cables. For dis­playing, our USB sensors do not require additional and often expensive and complicated to use mea­suring amplifiers. Via plug-and-play, the transmitter can be easily connected to a standard PC. Be­fore initial operation, only the USB driver, included in the scope of delivery, as well as the configu­ra­tion and analysis software must be installed on the PC. Typical applications for this sensor type are for example screw driving technologies, test bench applications such as the examination of engines, gears, bearings and seals, … wherever high speeds in continuous operation and standardized output signals are required on sensor side.